These Blog post Photo tips are not photography tips as I take average photos only but sharing some blogging photo tips as photos are such an important part of a blog post and help popularize your blog! 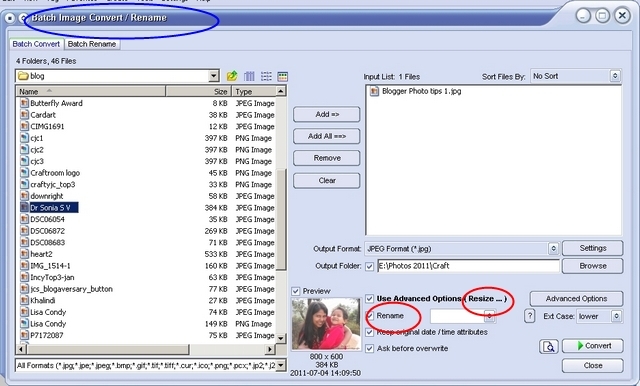 When you download photos from your camera they will have meaningless names .Before you upload/post your photos rename your photos manually or more easily using a batch rename software . This helps search engines such as Google to identify your photos and can increase your blog traffic.This is a very basic and easy to follow blogging photo tip! When you take photos on your camera the size is very large. Before you post them on your blog you have to re-size these photos and make them smaller. Most of us use free photo sharing sites such as picasa, photobucket, flikr etc. Picasa is a popular photo storage site for blogger and it has a limit on the photos based on the total size. If you kept uploading large megapixel photos- you would soon run out of your free quota on the free site! Large photos take a long time to load on your blog page. Re-sizing your photos too small has a tremendous downside as they loose clarity and details are compromised. I generally use approx 400x 300 pixels for photos I post medium size and 640 x 480 pixels for photos I post as original size [the large ones]. 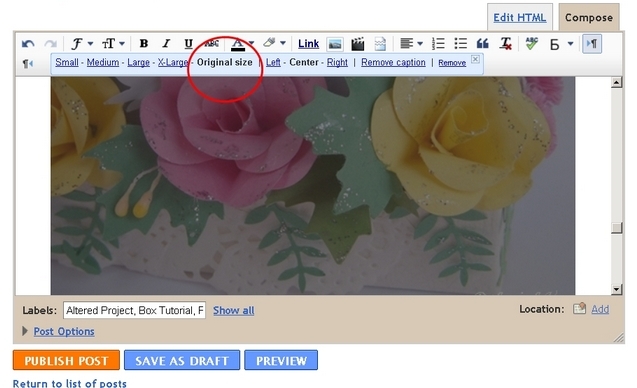 You can quickly resize your blog post photos using the batch re-size function of a photo-editing freeware. Many a times if the photo is posted small you have to click on it to see things better.Since blog surfing isnt at a leisurely pace always , the pundits say having to go an extra step to click on a photo to view it better puts people off ! Large photos look nicer but have a down side- they take longer to load on your page ! So no consensus on this point -do what you like!! 1) Anyone who saves your craft photo for inspiration and later creates a project based on it can more easily credit it to you. 2)The other way watermarking helps is it deters unscrupulous people from stealing your images and claiming them as their work to some extent. 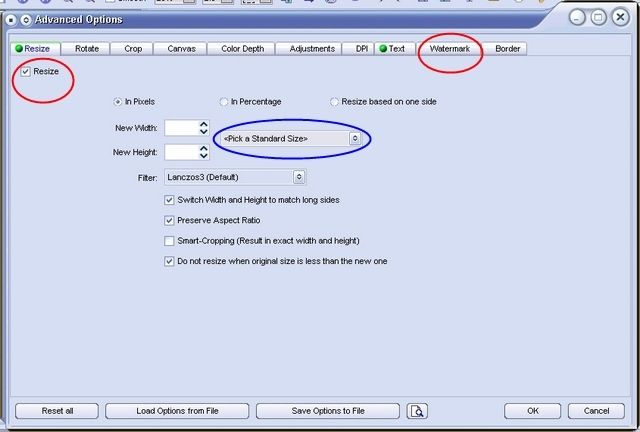 Popular photo-editing freeware can easily help you to even batch watermark your photos. Positioning it across the center or in the background makes it difficult for anyone to crop it off or erase it and is one of the best watermarking positions.I personally dont like the watermark in the center as I feel it is distracting for the viewer. The watermark should not be so large as to dominate your photo and spoil the beauty of your creation. Disabling right click is a huge deterrent to anyone saving your picture. I don’t like doing that cos I feel it is an honor that a person is saving my photos to inspire them! Just because someone saves your picture doesn’t mean they will misuse it! And if someone wants, they are many ways to still capture the image despite the disabled right click! Most of us are casual photographers and it will help our photos tremendously if we can use some simple photo enhancing tricks! The simplest tricks are playing with the brightness and contrast of your photos using a software. What photoediting software to use? The "boss" is Photoshop but I didnt have the patience to master it and have played around with quite a few freeware. Now settled on 2 freeware Photoscape [ helps add lines and shapes on tutorial photos] and Fast stone image viewer[ helps me batch edit fast]. Why I like these are they are easy to learn and not too complicated to understand!A caution about auto enhance feature on photo editing software-- most of the time your photo looks odd if you use it! So better adjust the brightness, then the contrast etc one by one. Embossing- take several shots from different angles and you might get lucky! Shiny papers- A big pain to capture. Anyone worked out a solution do let me know! Photos at night- A big majority of us are night bloggers and even nocturnal crafters so mastering night time photography would be quite a boon! U can use the flash or the Party/ Indoor mode of your camera. You can use a lightbox like the professionals Or you can heavily play around with your photo-editing software. However I always find it easiest and in the long run quicker to take pictures in daylight outdoors[ only drawback- have to wait for free time in the day!]. Close up shots – most digital cameras will have an option for close-up mode. Since most of us are amateur photographers it pays to use this easy option of your camera. White craft projects/cards- very difficult to capture the beauty of white- place a dark chart paper or back ground against your project while taking the photo and the contrast just may do the trick! Easy Craft photo tip- The easiest way to get " good " pics is to take a white chart paper outdoors , prop it behind your craft project. Snap in normal or closeup mode in natural daylight and 95 % of the time you will get a good photo! 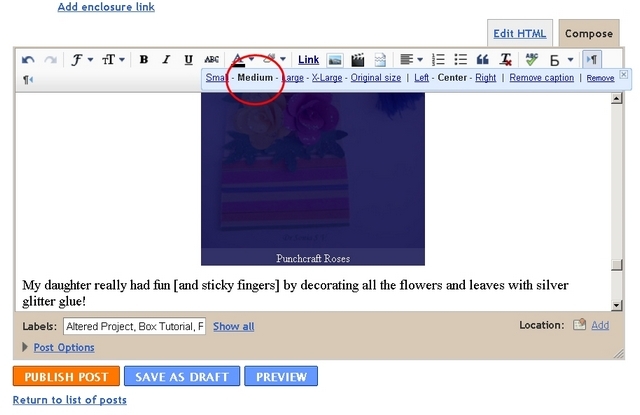 This blog post photo tip again helps search engines find your photos.This photo shows a screen shot of a blog post editing window. 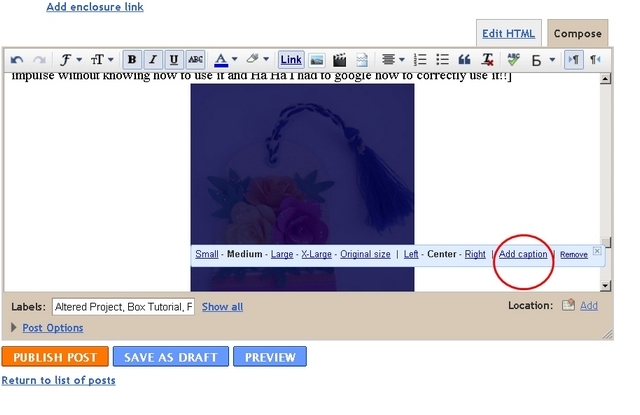 Click on the photo in your blog post draft and an "Add caption" will show up.Click on it and type in a descriptive photo caption. Choose the first photo of your blog post wisely as this is the photo which shows up on the reading list of the blogger dashboard of your readers .This photo along with the blog post title will be instrumental in making your follower decide whether to visit your blog to check out your post! So the most beautiful photo should be at the top of your post! Not everyone will be inclined to visit if on the dashboard they see a blog hop’s blinky or a challenge Bingo table but will surely be more tempted to click on to your blog if they see your lovely creation! 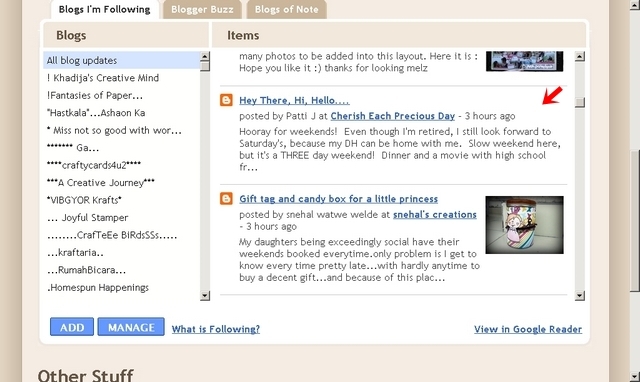 Check your blog dashboard reading list and tell me if its true! Post a photo towards the top of your blog post write up. Do I click ??? Yes I do since she is my friend and I know how creative she is .I dropped by her blog and was greeted with a stunning project.. the gorgeous photo hadn't shown up on my reading list as she had posted it lower down her blog post and not at the top. Do drop by Patti's blog and see her awesome card! So if its a friends blog you will go over no matter whether the heading is catchy or whether a photo is there or not but not all your followers will do that-- to tempt the casual reader to drop over to your blog ,you need a photo to show up on their reading list! For bloggers who use google reader to track the blogs they follow, this whole issue doesn't arise at all! We all love photos but dont be tempted to make a blog post with only photos. This is a mistake many budding bloggers make including me. Many of my early posts are photo only posts! Either I didnt have the time to write about the project or was hesitant or I didnt know what to write! Why should you not post a photo only blog post? 1.Google search engines cant see the photos- they need a word description- so put in at least captions! 2.Most of your readers would like to know something about your photos- So do pen down a few descriptive words as it keeps the post interesting and more interactive. If you are blogging about a project you are particularly proud of -- do take multiple photos from different angles and some closeup shots. It draws your readers attention to the different facets of your project and is visually more satisfying! This is the last blogging photo tip --- always preview your blog post before you publish it! You will realize yourself which photo needs to be published in a larger size , which photos need tweaking and you may even decide not to post a blurry picture altogether! Dear friends I am no photography expert or a computer wiz- these tips are what I have managed to imbibe in this crafting blogging journey and sharing in the hope it is of some help to my bloggy buddies! Do add your experience, tips and suggestions so that we can all learn from our experiences. Thank You for taking the time to encourage me Simran! Thanks for the info. It's very useful. Such great information, Dr. Sonia! Thanks for taking the time to post these tips. Some tips I had no idea at all like naming my photos. Yes Helen I didnt know it earlier too and discovered it when I searched Dr Sonia S V on google and many of my cards turned up in the search results-- that was because I had named them as Dr Sonia S V ! Now I think of better names for my projects than my name!! Thanx a ton a bunch ! gawd ! how can a doctor be so versatile .. i m amazed! i saw u r from aiims ! I almost fainted .. my lil sister is preparing for it and my dad is gastroenterology doctor from BHU . Wow so you are from a doctors family. Your comment has put me on cloud 9 !! Thanks a lot Dr. Sonia.......I'll definitely follow your advice. Thanks a lot Dr. Sonia.......I'll definitely try your advice. Thank you for sharing the tips, it's a big help, have a good day!!! What an excellent set of tips, Sonia! Thanks so much for taking the trouble to post them. AWESOME GREAT TIPS SONIA . .could you pls tell how to collage the pictures .its a great way to use for step by step instructions . 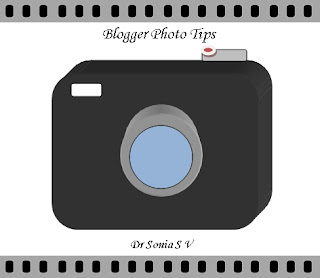 Thanx for these informative tips ,Sonia.So informative for an amateur blogger like me. What a great post this is. So many useful tips here. Ann you are making me blush and cringe since you are such a photo professional!! Good tips! Like you, I like the large or orginal size photo, too. And, I do really intend to start making more pictures...just need time.I can get around to it in the near future. It does make it all the more interesting. I use Picasa, but just this weekend, I saw a tutorial on Windows Live Photo Gallery and it may do one or two more things than I can do now. So, I'm going to try it out as my computer came with it. All very worthwhile tips. I have the joy of having wonderful Canon camera equipment that my hubby gave me. I have a Canon point & shoot also that I carry with me at all times but when I want to photo my cards or such I use my better Canon. One other tip that I seem to enjoy is the presentation of the photo by including props or such in the photo to tell a story. Yes Melissa you do that so well... I just barely make it to my balcony with the craft project , white paper and camera for my photo shoot sessions! Thanks for taking the time out for such a post doctor. I real through it all. I am sure I have learnt a lot. Lisa I hoped it will be helpful when I formulated this post and am glad it seems to be appreciated! Thanks for sharing such informative tips,,..
No doubt u r the most successful blogger Sonia! !These tips have loads of tips in them! !So thoughtful and well explained!! Kudos!! u r one amazing human, I admire!! ooh I am glowing !! Beckie Thank You so much and you are such a sweet heart for dropping by to let me know! 2. I also post medium size pics and hope the reader would click and view the actual sized picture. One thing that I do, besides giving a photo a caption and relevant file name, for the purpose of Search engines, I also add the html "alt" (alternate text) tag and "title" tag to my pictures. It involves editing the html from the html tag. Thank You for such valuable inputs Somu. I have read about alt tags too but havent yet put it into practise as I read conflicting reports about its SEO usefulness! Thanks for stopping by Sonia. Yes it was very nice talking to u... MY BIL has visited that hospital that you suggested... Thanks so much.. The tips are really helpful. Hello! Thanks for sharing all your tips. Hey really sweet of you to take so much time out to explain to all of us abt blog photos. In so much detail.. :-) :-) Thank u.. Thanks alot for the tips.It really helps heheh. I have many things to change . I really want to ask though How do you make the Reply button to appear?Im not sure how to add it . Thanks again for this and for taking from ur free ime to help all of us newbies. You are just amazing. So well read and the best part is that you take time out to write a post especially to help your fellow bloggers. I must say I am complete fan of yours......would really love to meet you someday. Thank you Darshana..would love to meet a crafty friend too! So kind of you and I am no blog or photography expert..just like you sharing my blogging experience! Thank you Mr Philip..my Malayalam reading abilities is of first standard level only though I can converse fluently in Malayalam..but will try to see if I can read your blog! When i was reading your post,i was recollecting my mistakes which i have done.Your post has really helped me a lot coz i'm not a good photographer but still trying...till date i did added any caption but will surely make it a habit.Nice that along with the crafts you wrote something so useful for newbie bloggers. I have a couple of doubts - can i add the watermark using MS paint? and how to remove the self- blogviews? any ideas on that? I'm just dumstruck, Sonia. How you put the information in a good narrative way. I keep reading all your posts, even at office hours ;-) There are plenty of posts with informative. I don't know which to leave, but i want to note it down everything. Better i stop this and send a mail to you. I'm inspired by all your posts actually. You are the good inspiration/encyclopedia for all crafters.